WASHINGTON—Cardinal Timothy M. Dolan of New York, chair of the U.S. Conference of Catholic Bishops’ (USCCB) Committee on Pro-Life Activities called the Senate’s failure to pass the Pain-Capable Unborn Child Protection Act “appalling”. The bill proposes to ban abortions starting at 20 weeks after fertilization. NO DOWN SYNDROME BABIES BORN IN ICELAND—ALL ABORTED! Before getting into the details of this shocking piece, let me begin with a personal proclamation: I actually pity those who have never known a person with Down syndrome—whatever their age. Those who have not, have missed out on a wonderful experience indeed. And that is accompanied with lots of love. These are the most loving people anyone could find on earth. Indeed, they see only the best in everyone they meet. Their minds are so pure that I doubt that they are capable of even thinking about evil. At first glance, they look a bit different from others, then the beauty begins to emerge. That beauty can only be discovered by those who have a pure heart. But there are people who are driven only by the cosmetic good looks of anyone they meet which is the magnet that draws them. The heart doesn’t matter, just knockout good looks. How shallow. Yet because those with Down Syndrome do look different and have the mind of a an eight or 9-year-old, many are rejected, with the hard-hearted avoiding them altogether. But even with a limited mental ability, they are very dependable. Many work at jobs in grocery stores, restaurants and even helping as clean up crews in college cafeterias. I saw a group of them sitting in a restaurant, having seen them earlier cleaning the cafeteria after lunch at Los Medanos College in Pittsburg, California. Stopping at their table I complimented them on the fine job they did earlier at the cafeteria. They all broke out in the sweetest smiles one could ever see. They were delighted for being recognized for a job well done. They are all so very appreciative. And they are happy with their lives. • 99% of people with Down syndrome are happy with their lives. • 97% of people with Down syndrome like who they are. • 96% of people with Down syndrome like how they look. Statistically the vast majority of people with Down syndrome are happy, satisfied, and affectionate members of society—something that couldn’t necessarily be said of people born without the disability. Yet, there has been a madness sweeping through the “me first” society we live in that causes many women, who learn their baby in the womb will have that condition, panic, and arrange to have that baby painfully aborted. I say painfully since the heart of the baby in the womb begins to beat shortly after conception and their nervous system develops, meaning they can feel pain. And how is a baby aborted? A scissor like instrument is inserted in the mother’s womb, where it tears off the arms and legs of the baby and lastly its head. And the baby, yes baby, not a fetus, feels everything and silently screams and twists in agony. Iceland now has a dubious distinction that 100 % of Down Syndrome Babies are aborted in that country. Meaning none are born there, yep, everyone is pure. The Iceland Government has not ordered this as law, but they have tacitly encouraged it. Denmark is not far behind Iceland, aborting about 90% of those babies. Great Britain is a supporter of these abortions as is of course, The United States. 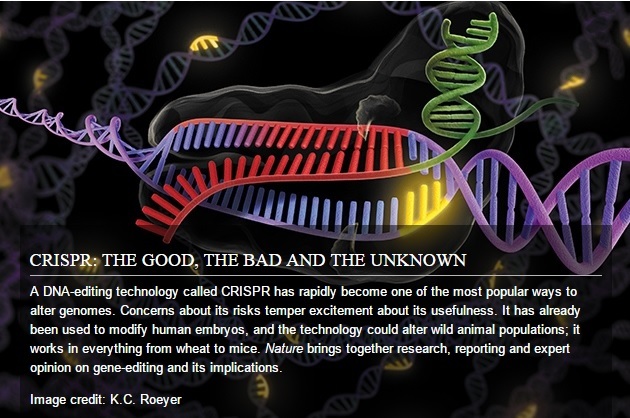 CBS TV that is headquartered in the U.S. stated on the air that Geneticist Kari Stefansson said, “My understanding is that we have eradicated all births with Downs Syndrome here in Iceland.” And this news item was reported in a celebratory manner. In the U.S. the main reason for abortions is that the baby to come is simply inconvenient and could hamper the party life of the accidental mother and father. Besides, with this generation, nobody wants to take care of anyone except themselves. This is what the “Me First’ generation has brought. I find it extremely difficult to see the cruelties of so-called human beings. There was a time that children and adults with Down Syndrome were put into insane asylums. There is nothing insane about any of them. They just have a limited mental capacity. This would mean that all 4th, 5th and 6th graders should be in mental hospitals. Years ago, someone very close to me worked in the California State Hospital system. She told how these gentle people were mistreated and deliberately caused pain and horror. When they were taken to the dentist, no pain medication was given while drilling in teeth or pulling a tooth. They would scream and try to get away when told they had a dentist appointment. This is outrageous! They ARE very much human beings even though the savages in those institutions don’t seem to think so and it might be added that those savages who would do such things are NOT human beings. There was something that set her apart from the beginning. She was dancing when she was only six years old. She began competing in junior pageants and in 2015, she was crowned Miss Minnesota Junior Miss Amazing. Readers, please be kind to everyone you see or come across during your day. If you pass a homeless person, please don’t look away from them as though they do not exist. As you walk by, turn your head toward that person, make eye contact and with a smile say “Hi” to them while continuing on your way. That will make their day since that little gesture shows you recognize him or her as a human being. And again, our sincere thanks to Brandon Steward, the writer of the original story of Mikayla. Please be kind to every living creature you see. That means two-legged ones and 4 legged ones. A better world begins with each one of us. Oh yes. Earlier you were told about the friend I had who worked in a state hospital. She loved the Down syndrome patients she worked with and took them on field trips in her SUV. She once took them to see Dolly Parton who did a show in that city. They all sat in the front near the stage. Ms. Parton saw them sitting there and during intermission came down off the stage to visit with them before the second half of her show. This writer will love that woman for life after learning this. Odd way to start an article on the choice of supreme court judges? Well, not really, because it is up to all of us. It’s up to us to be the John Does who speak up for life…life of the unborn. It is ultimately the most important decision our new President will make, and it’s a decision that will affect America for decades to come. We need to be the catalysts who ensure pro-life Supreme Court Judges. The movie, Meet John Doe, with Gary Cooper and Barbara Stanwyck, is just one of the many famous Frank Capra movies that were so successful. Mr. Smith Goes to Washington is another famous Capra film starring Jimmy Stewart and Jean Arthur about a newly appointed United States Senator who fights against a corrupt political system. Mr. Deeds Goes to Town, with Gary Cooper and Jean Arthur, is another wonderful Capra film, but it’s the John Doe movie that represents the common man. Truly, the common man elected this outsider, Donald J. Trump, who will not play the globalist games or buy into the one-world-order agenda put forth by both Republicans (the Rockefeller Kingmakers) and the Socialist Democrats for far too many decades. This outsider has promised us pro-life supreme court justices, and we need to help him achieve that goal in spades! A remarkable 90 pro-life groups have signed onto the a fabulous coalition letter, drafted by Andy Schlafly and loyalists and friends of Phyllis Schlafly’s who were early Trump supporters. The letter with the pro-life group signees has been delivered to both President-elect Trump in New York, and Vice President-elect Pence in Washington D.C. Please review the letter, because it contains an Appendix which includes six candidates on President-elect Trump’s list of 21 Supreme Court Justices who lack any pro-life record and have even shown an unwillingness to take a pro-life position publicly. On January 1st, 2017, Fox News Sunday read from the coalition letter, and the segment was aired again later on Sunday. This widely viewed news show also used Andy Schlafly’s superb analysis of the candidates, which you can read here. There are, indeed, vast differences among candidates on the list, especially with respect to Trump’s pro-life pledge. Some of the candidates (including Sykes and Colloton) have even repeatedly taken the pro-abortion side. Andy Schlafly believes that media and the senators will push for a woman simply because all four women on Trump’s list are not pro-life. Two true pro-life judges are Jennifer Elrod and Edith Jones who could be interviewed for the job, and I’d certainly like one of them to replace Ruth Bader Ginsburg. However, my personal opinion leans toward a strong Constitutional originalist and pro-life male candidate to replace Antonin Scalia. The three women presently on the court are far left liberals appointed by Socialist Democrat presidents. It is up to us, the John Does of the country, the common man who elected Mr. Trump, to stand up and fight for life. Our force is greater than we know…just look at what we have accomplished already with the outsider who is now our 45th President. We won the battle, but the war wages on, and we cannot rest on our laurels now. 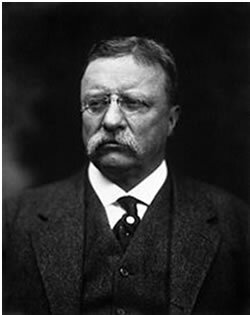 We can shut down the DC capital switchboard as we’ve done before. Let your voices be heard, loud and clear! 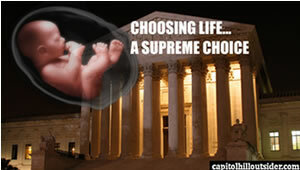 Pro-life Supreme Court justices for the unborn…this is the rallying call! The history of population reduction, of the falsely alleged “genetically inferior,” via eugenics goes back farther than most Americans are aware, and it involves many of our past leaders. 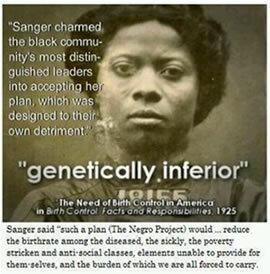 So, let’s do a short refresher course of Planned Parenthood and the elitists who promoted and funded eugenics. Margaret Sanger (1922), was the first president and founder of Planned Parenthood. The origins of Planned Parenthood date to October 16, 1916, when Sanger, her sister Ethel Byrne, and Russian immigrant, Fania Mindellopened the first birth control clinic in the U.S. in the Brownsville section of the New York borough of Brooklyn. At a March 1925, international birth control gathering in New York City, a speaker warned of the menace posed by the “black” and “yellow” peril. The man was not a Nazi or Klansman; he was Dr. S. Adolphus Knopf, a member of Margaret Sanger’s American Birth Control League (ABCL), which along with other groups eventually became known as Planned Parenthood. From there, Maafa 21 weaves a chilling tale of the efforts of racists in the United States to eliminate African-Americans from the population. Hitler credited American eugenicists with influencing his European agenda. Through the 20th century these influential bigots planned tactics such as injecting a sterilizing agent into public water supplies. The documentary explains how their racist efforts continue to the present day, and provides a legitimate explanation of the relatively unchanged size of the black population as compared with other races in the United States. The Rockefeller Foundation was established in 1912, and immediately began giving money to eugenics research organizations. (Edwin Black’s War Against the Weak) Eugenics was a pseudo-scientific and social science movement that emerged in the late 19th century, and gained significant traction in the first half of the 20th century. In 1965, former Republican President, Dwight Eisenhower, complained that the United States was spending money to slow the population growth of responsible families while at the same time providing financial incentives for ignorant, feebleminded and lazy people to have more babies. He said that history would rightly condemn the United States if we didn’t link welfare to family-planning. 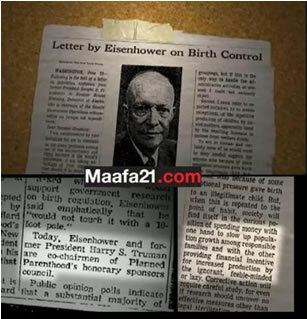 At that time, Eisenhower was the co-chairman of a Planned Parenthood fund-raising campaign along with former Democratic President Harry Truman. Remembered for the Vietnam War, the War on Poverty, and the Great Society, Johnson was also the first U.S. president to back federal support for birth control in social welfare and public health programs (at the urging of a Republican representative from Texas, George H. W. Bush). Margaret Sanger died midway through Johnson’s presidency in 1966. John Ehrlichman, who was an assistant to President Richard Nixon, wrote that Nixon once told him that African-Americans could not really benefit from federal programs because they are genetically inferior to whites. Later, Nixon would label birth control a national priority and sign legislation to make it available as a service of the U.S. government. Then in March of 1972, the Commission on Population Growth and the American Future which Nixon had created three years earlier with the help of Congressional Democrats, began calling for the nationwide legalization of abortion. 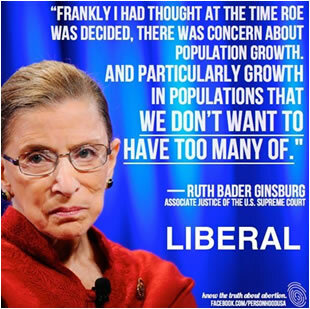 In a 2009 New York Times Magazine interview, Supreme Court Justice Ruth Bader Ginsburg told Emily Bazelon that, “…I had thought that at the time Roe was decided, there was concern about population growth and particularly growth in populations that we don’t want to have too many of.” The “Populations” Ginsburg and the rest of the Political Elite referred to is clearly defined in Maafa21. Trump reminded America during his third debate with Hillary Clinton that he is not afraid to stand up for the unborn, spelling out what partial birth abortion really is…the murder of fully developed babies in the womb. 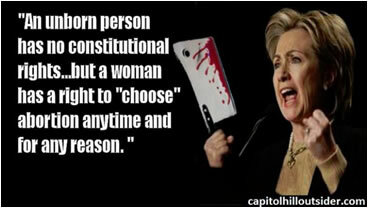 Abortion, an unjust, murderous procedure, should of course be illegal. Donald Trump has said that if he is elected president, he will appoint Supreme Court justices who would overturn Roe v. Wade and return the issue to the states where it belongs. 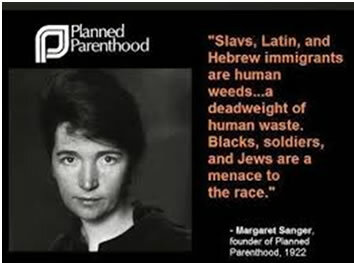 Planned Parenthood’s founder wanted to eliminate the black race, and abortion by the numbers, is a racist institution. In the United States, black children are aborted at three times the rate of white children; Hispanic children are aborted at one and a half times the rate. Whatever the intentions of the abortion industry, by functional standards, abortion is a racist institution. Yes, it’s up to us, the John Does of America, to stand up for life. The bottom line is that we need true pro-life justices. What greater right do we have than the right to life? MONTGOMERY-10/19/16—Let’s be blunt while putting this election in perspective. When you vote for Hillary, your vote actually pulls the switch to cruelly execute over five million (more) innocent babies. This is NOT simply executing inconvenient babies who have done nothing wrong, mind you, but actually cutting and tearing each little life apart, limb by limb, while they silently scream in agony. Little babies in the womb FEEL AGONIZING PAIN just as we do…every poke, cut and the tearing off their little limbs one by one. This has all been confirmed by medical science, yet you are ready to offend God so severely by gaining Hillary’s favor that you are willing to risk your own soul? Surely you have more sense than that. Paid-off voters who take part in this unthinkable cruelty—by voting Hillary—makes you each an accomplice, eventually bringing you face to face with God Himself, with severe consequences. Each of you will be judged and experience 100 times more excruciating suffering than the babies you killed by voting for a woman with no heart, no soul, and who has no regard for human life. Yes war has been declared on babies by Democrat Communists who seem to want NO babies to be born. For example, according to Life News, a Federal Judge just blocked an Alabama law to ban dismemberment abortions that tears babies apart, limb by limb so they can be more easily sucked from the womb. That judge is U.S. District Judge Myron Thompson, who also issued a preliminary injunction against a second law prohibiting abortion facilities from doing business near elementary and middle schools, according to ABC News reports. The dismemberment abortion ban has the potential to save hundreds of unborn babies in Alabama. In 2014, there were 594 abortions in Alabama that occurred in the second trimester or later, the Montgomery Advertiser reports. Dismemberment abortions, also known as dilation and evacuation or D&E abortions, which typically are performed on a nearly fully-formed, living unborn baby in the second trimester. It is a barbaric and dangerous procedure in which the unborn child is ripped apart in the womb and pulled out in pieces. How can we call ourselves a civilized people when we allow such savage action against babies? This unconscionable barbarity cannot and must not be allowed to continue. On Thursday, Judge Thompson blocked both laws, arguing that they would restrict women’s access to abortion in Alabama. Yes, this is the way of thinking for CPUSA, with no thought of consequences. They WILL give serious thoughts to those consequences when they face the final judgment before God that they will not be able to buy or cunningly manipulate their way out of. He gave similar reasons for blocking the measure preventing abortion facilities from doing business within 2,000 feet of elementary and middle schools. He said the law would have forced two of the state’s busiest abortion facilities to close or move. The two facilities in Tuscaloosa and Huntsville performed more than half of all the abortions in Alabama in 2014, according to the state Department of Public Health. “The availability of abortions in Alabama would be significantly reduced, and abortions beginning at 15 weeks would become almost wholly unavailable,” Thompson wrote. Pity. Such an inconvenience for women who have no morals. The Huntsville abortion clinic opened across the street from a middle school several years ago. According to the Times Daily, the facility administrator, Dalton Johnson, said they moved to that location after being forced out of a building in downtown Huntsville due to the 2013 Women’s Health and Safety Act. The state enacted that legislation in response to multiple botched abortions in Alabama. The American Civil Liberties Union challenged the two laws earlier this summer on behalf of the two top abortion businesses in the state. WVTM 13 reports the ACLU argued that the laws are an “undue burden” on women’s access to abortion because they could close two of the busiest abortion facilities in the state and severely limit second trimester abortions. One can always count on the ACLU to lead America straight to hell. The dismemberment opposition law embodies model legislation from the National Right to Life Committee that would ban “dismemberment abortion,” using forceps, clamps, scissors or similar instruments on a living unborn baby to remove him or her from the womb in pieces. Such instruments are used in dilation and evacuation procedures. Dismemberment abortion bans have been voted into law in Kansas, Oklahoma, West Virginia, and Mississippi. Similar legislation has also been introduced in Pennsylvania, Minnesota , Idaho, Nebraska, Missouri, Louisiana, Rhode Island, and Utah. This should and must take hold nationally. And by the way, Donald Trump will put a stop to this cruel but profitable inhuman abortion industry. People, there is more at stake in this election than you can even imagine. It is an election that could destroy America as well as your own soul. This is how crucial it is. Please pull away from manipulation and T H I N K. Don’t play Russian Roulette with that one bullet you have to fire into your head. She made that clear in the last debate. 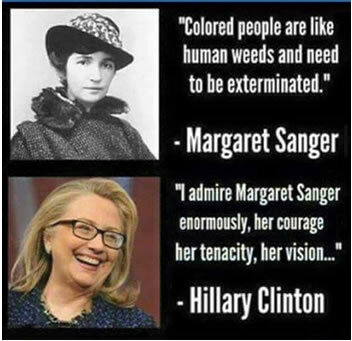 Hillary’s love of the butchery of Planned Parenthood should be enough for pro-lifers to vote for Donald Trump. Any Christian who votes in a way that enables Hillary Clinton to become president, empowering her to name Justice Scalia’s replacement and pack the courts with pro-abortion radicals, must be prepared to accept responsibility for the continued carnage of the unborn and the inevitable restrictions on religious liberty. Donald Trump’s surprise visit to Mexico, where he met the Mexican president and discussed the many contentious issues between our two countries, reminds me of President Reagan’s important trip to Geneva in 1985. Reagan was more than willing to sit down with the Communist leader of the USSR in an effort to build a personal connection between the two men without sacrificing America’s vital interests in the Cold War. The 1985 Geneva summit was highly advertised as a potential showdown between Reagan and Mikhail Gorbachev, the supposedly reasonable new Soviet leader. When it was over, Americans realized that behind Reagan’s genial affability was a steely determination to protect our country against the threat from Soviet nuclear missiles. Just as today’s mainstream media are bent on undermining Trump’s call to put Americans first in our dealings with Mexico, the media of the 1980s (led by ABC’s Sam Donaldson and CBS’ Dan Rather) were overwhelmingly pro-Gorbachev and anti-Reagan in their daily coverage. Left-wing celebrities from around the world converged on Geneva to support the media narrative that a stubborn President Reagan was refusing to consider Gorbachev’s reasonable proposals for world peace. Rep. Bella Abzug, actress Jane Alexander and the inevitable Jesse Jackson were giving daily interviews. I led a delegation of 25 distinguished women leaders to Geneva to support Reagan and American nuclear superiority. The media didn’t give us much coverage, but President Reagan telephoned me afterward from the White House to thank me for our support. Reagan had been elected on a promise to “win” the Cold War against the Communist forces arrayed against America. Before Reagan, our country’s foreign policy was controlled by men like Henry Kissinger, who thought victory was impossible and that his job, as he famously told Adm. Zumwalt, was “to negotiate the most acceptable second-best position” for the United States. After three decades of steady deterioration of America’s place in the world, Trump is the first candidate since Reagan who is comfortable using Reagan’s vocabulary of winning. Trump has pledged to make America “win” again, instead of being cheated and outmaneuvered by our adversaries and even our so-called allies. Trump’s visit to Mexico recalls Reagan’s trip to Geneva in other ways, too. At both meetings, there was one signature position on which the American refused to budge. Reagan’s no-surrender pledge was his unwavering commitment to the Strategic Defense Initiative, that is, to build and deploy a system to shoot down Soviet nuclear missiles headed for our cities. With Trump, it’s his rock-solid promise to build “an impenetrable physical wall” on our southern border. Both Reagan’s and Trump’s signature ideas were purely defensive weapons to which no country could have any legitimate complaint. Reagan’s SDI was a non-nuclear weapon whose only function was to destroy or deflect incoming nuclear missiles. Reagan stuck to that non-negotiable position at the summit with Gorbachev the following year in Reykjavik, Iceland. As we now know, that’s when Gorby realized he could never win an open competition with the United States, so that his “acceptable second-best position” was the dissolution of the USSR over the next five years. Likewise, Donald Trump’s wall is not a provocative, but a neighborly idea to stop the rampant illegality that harms both nations along the U.S.-Mexico border. With no legitimate objection to erecting a fence, wall or other physical barrier between our two countries, Mexico should be grateful for Trump’s leadership and even agree to help pay for it. The value of a wall begins with stopping “murderers” and “rapists” from freely entering and re-entering our country with impunity, as Trump mentioned when he announced the start of his campaign last year, but it doesn’t stop there. Felony assault by motor vehicle is another deadly crime that seems to be rampant by illegal aliens driving recklessly without the licenses or insurance law-abiding Americans take for granted. The wall would also stop the plague of heroin that has exploded during the last few years of the Obama administration. Deaths from heroin overdoses surpassed deaths from car crashes last year and will hit a new record this year. Most U.S. heroin is delivered by Mexicans working for the drug cartels. Of course, most Mexican immigrants are not murderers, rapists, drunk drivers or drug dealers. But even the good, hardworking people who come here from south of the border, both legally and illegally, have such low education and skills that they can’t survive economically without massive public subsidies to provide for the care, food, shelter, health care, education and welfare of their children. Albany, NY – The Empire State has long been known for its pro-abortion laws, but the latest bill passed by the NY House takes it to a whole new level. “Expanding cruel and brutal third-trimester abortions has long been a goal of the anti-life lobby who never met an abortion they didn’t like. With no regard for the fully developed unborn baby who is violently dismembered, or otherwise killed, the New York State Assembly once again put the abortion lobby above New York State women and their children. Elite think the “Amazon.com” of fetal tissue is totally normal. Clearly there are more questions and falsehoods surrounding the fetal tissue scandal. But it isn’t Planned Parenthood’s feet being held over the fire. Here in liberal bizarro land, an attack on the first amendment is well underway. The Center for Medical Progress issued a response stating they would not be intimidated by the government or Planned Parenthood following a raid on its founder’s home Tuesday. “This is no surprise—Planned Parenthood’s bought-and-paid-for AG has steadfastly refused to enforce the law against the baby body part traffickers in our state, or even investigate them—while at the same time doing their bidding to harass and intimidate citizen journalists,” Daleiden wrote yesterday. The California Attorney General refused to release details regarding the raid, telling USA Today they couldn’t comment on an ongoing investigation. Earlier this year, Planned Parenthood filed a federal lawsuit in San Francisco district court against the Center for Medical Progress, accusing the pro-life group of carrying out illegal secret recordings, invading its associates’ privacy and alleging they waged a “reckless and malicious smear campaign that was designed only to spread lies about Planned Parenthood,” according to the company’s chief executive in California. Daleiden responded that he would be pleased to take the matter to court for an opportunity to expose the leaders of the organization behind the gruesome practice. “Game on,” Daleiden said. “I look forward to deposing all the CEOs, medical directors and their co-conspirators who participated in Planned Parenthood’s illegal baby body parts racket. Today, Harris County District Attorney Devon Anderson (pictured) defended her indictment of pro-life advocate David Daleiden despite the fact that a Planned Parenthood abortion business board members works as a prosecutor in her office. Now, new information has come to light that Anderson’s campaign received more than $25,000 from the attorney who works for a late-term abortionist. As LifeNews reported Monday, a Texas grand jury has ignored the videos exposing a Houston-based Planned Parenthood abortion clinic caught selling aborted baby body parts and has instead indicted the man behind producing the expose’ videos. Karpen was represented at his trial by attorney Chip Lewis, who donated more than $25,000 to Anderson’s re-election campaign. 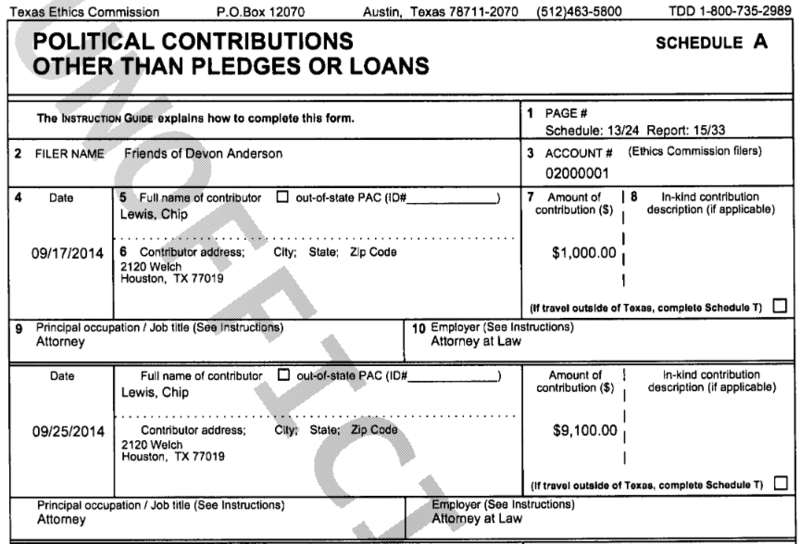 According to official campaign finance records from Harris County, Lewis donated a total of $15,000 to Anderson’s re-election campaign in 2014, with a $10,000 donation from Lewis to Anderson in February and another $5,000 from Lewis to Anderson in May. 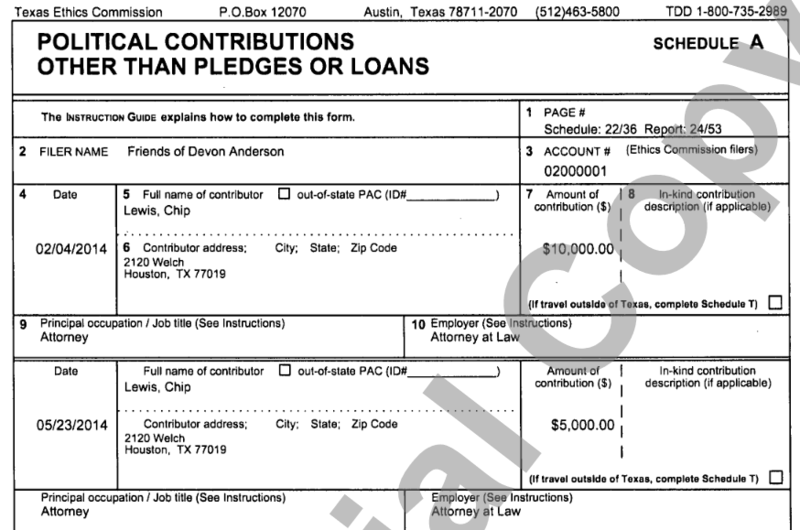 The abortion practitioner’s attorney made additional contributions to Anderson’s campaign later int he year — with Lewis sending another $1,000 on September 17 and $9,100 on September 25– as these Harris County campaign finance records show. As to the Karpen case and Anderson’s lack of an indictment, the pro-life group said that grand jury failed to return a “true bill” that would have led to Karpen’s prosecution. Operation Rescue has reason to believe that the grand jury did not have access to all the evidence, and that Anderson’s close personal relationship with Karpen’s attorneymay have contributed to the failure of the grand jury to indict Karpen. “Where there’s smoke, there’s fire, and there’s just too way much smoke blowing Planned Parenthood’s way in Harris County for us to feel remotely comfortable that Anderson’s office can conduct a fair and impartial investigation,”the group said at the time. Now that Anderson’s office has indicted the pro-life investigators, Cheryl Sullenger, Senior Vice President of Operation Rescue is renewing the criticism. 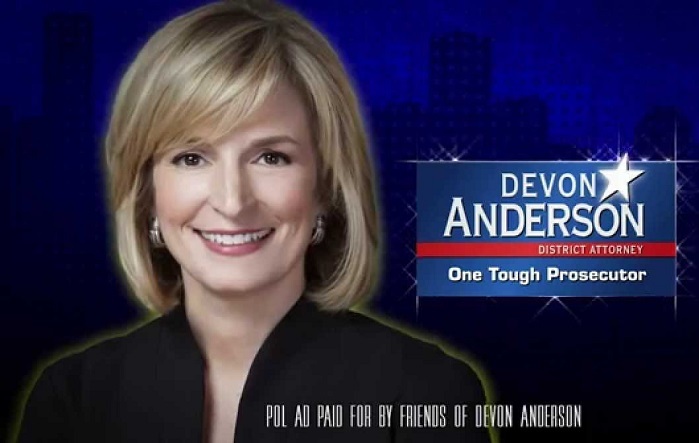 “There is now a pattern in Houston of District Attorney Devon Anderson’s office covering up abortion-related crimes,” she told LifeNews. Anderson has come under considerably fire for what pro-life advocates call a politically motivated indictment and because a Planned Parenthood board member works for Anderson as an assistant district attorney. Lauren Reeder is a prosecutor in the Harris County District Attorney’s criminal family law division. Reeder is listed as a non-compensated “Director” on the 990 Tax Form for 2014 filed by Planned Parenthood Gulf Coast. The full, unedited videos have confirmed that revelations that some aborted baby remains sold by Planned Parenthood go to biotech companies for the purpose of creating “humanized” mice. Meanwhile,Planned Parenthood has been exposed as having sold body parts from aborted babies for as much as 15 years. The federal law that technically prohibits the sale of aborted babies and their body parts was written by a pro-abortion Congressman decades ago and essentially spells out a process by which sellers of aborted baby body parts can meet certain criteria that allows the sales to be legal. That’s whya Colorado congressman has introduced legislation to totally ban the sales of aborted baby body parts. What I have heard and read this grand jury has opened the door to all those officers who go undercover – using false documents (drivers licences) to infiltrate terrorist groups. Will the ISIS terrorists soon sue this government for the same thing and make it stick????? Will they go after the fake Patriots in the Bundy standoff????? There is something very STINKY about this Grand Jury ruling, IMHO. How many on it are supporters of the baby killers in Planned Parenthood? What this Grand Jury has done is put their stamp of APPROVAL on the selling of murdered baby body parts and prosecution of those seeking to expose this murderous activity for profit. Talk about sacrificing to Moloch. I bet that if there was any honesty in this – we would discover that some involved are making money in one way or another from keeping the killing fields of Planned Parenthood in operation and punishing anyone who goes against their $$$$$$$ machines. Washington (CNN)A Texas investigation into Planned Parenthood on Monday culminated in an indictment — of the organization’s accusers instead of the group. The Harris County District Attorney’s office announced that Planned Parenthood Gulf Coast had been cleared in the two-month-long investigation. But the grand jury did indict two individuals who were involved in making secret recordings of the group that were released to publicly discredit the group, which provides health services and abortions. David Daleiden and Sandra Merritt were indicted for tampering with a governmental record, a second-degree felony, and Daleiden was also indicted on the count of prohibition of the purchase and sale of human organs, a class A misdemeanor, according to the Harris County district attorney. According to the Harris County District Clerk’s website, a warrant for Daleiden had been issued Monday evening. 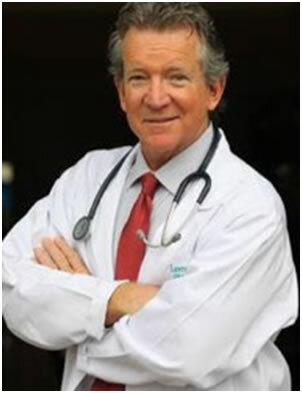 Daleiden’s Twitter profile identifies his residence as Irvine, California, where his group, the Center for Medical Progress, is located. The indictments were not yet available. “We respect the processes of the Harris County District Attorney, and note that buying fetal tissue requires a seller as well. Planned Parenthood still cannot deny the admissions from their leadership about fetal organ sales captured on video for all the world to see,” the statement from a spokesperson said. 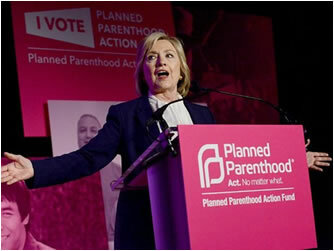 Planned Parenthood officials lauded the indictments. “As the dust settles and the truth comes out, it’s become totally clear that the only people who engaged in wrongdoing are the criminals behind this fraud, and we’re glad they’re being held accountable,” said Eric Ferrero, vice president of communications for Planned Parenthood Federation of America, in a statement. According to Planned Parenthood, officials in eleven states have cleared the group of wrongdoing. Officials in another eight states declined to even investigate the accusations made by the Center for Medical Progress. Texas Gov. Greg Abbott said state officials were continuing to investigate the Texas Planned Parenthood, however. The Texas attorney general echoed Abbott and said the state investigation will continue. “The fact remains that the videos exposed the horrific nature of abortion and the shameful disregard for human life of the abortion industry,” Texas Attorney General Ken Paxton said. “It is a sad day in America when those who harvest the body parts of aborted babies escape consequences for their actions, while the courageous truth-tellers who expose their misdeeds are handed down a politically motivated indictment instead,” Black said. “Today we see that the truth still matters,” Rep. Jan Schakowsky, D-Illinois, said in a statement. Daleiden is a project lead for the Center for Medical Progress, a group that produced a series of videos over the summer depicting Planned Parenthood officials discussing fetal tissue and appearing to talk about the price for such tissue. Planned Parenthood maintains that it does not profit from the sale of fetal tissue and only recovers its cost. After the videos raised controversy, Planned Parenthood announced it would no longer accept reimbursement. The videos were edited and in some cases contained footage that was not aborted fetuses at all. In one, Daleiden used footage of a still-born child he found online with a narration about a Planned Parenthood abortion of a fetus the same age. Planned Parenthood this month filed a lawsuit against the Center for Medical Progress, alleging the defendants lied their way into the recorded meetings and set up a fake company and personal identities to pull off the videos. The lawsuit also accuses the group of committing crimes including wire and mail fraud, invasion of privacy, illegal secret recording and trespassing. The videos have been an intense topic on the 2016 campaign trail, with Republicans using them as evidence to call for the dismantling of Planned Parenthood, while Democrats have rallied around the organization. Conservatives were dismayed with the indictment Monday, and some accused the Harris County DA’s office of being biased because one of its prosecutors, Lauren Reeder, has served on the Planned Parenthood board. In August, when Reeder’s background was disclosed by the DA, Anderson insisted she would be separated from the case. “She will not be involved in any manner in this investigation,” Anderson said at the time, according to the Houston Chronicle. CNN’s Jeremy Grisham, Christopher Lett, Drew Griffin and David Fitzpatrick contributed to this report. A Texas grand jury has cleared a Planned Parenthood clinic of wrongdoing, and instead indicted two pro-life filmmakers who published videos alleging the abortion organization’s á la carte fetal organ harvesting. On Monday, a Harris County Grand Jury charged Center for Medical Progress President David Daleiden and activist Sandra Merritt with “tampering with a governmental record,” a second degree felony. Daleiden was additionally charged with a misdemeanor count regarding human organ procurement. Harris County District Attorney Devon Anderson said they were left with no choice but to charge the filmmakers after an investigation on the Planned Parenthood Gulf Coast clinic in Houston turned up clean. Hours before the indictment was announced, Daleiden published an op-ed in USA TODAY calling Planned Parenthood’s lawsuits a diversionary retaliation tactic meant to obscure their crimes. “It is telling that in Planned Parenthood’s new anti-First Amendment lawsuit, it is suing me for everything but defamation,” Daleiden wrote in regards to another lawsuit lobbed at his organization in California. “The truth will continue to come out through the congressional probe, through the ongoing state investigations and through the frivolous lawsuit Planned Parenthood now brings in retaliation for its exposure,” wrote the CMP president. Texas Governor Greg Abbott, who ordered an investigation into Planned Parenthood after the Center for Medical Progress videos emerged, said Monday the grand jury’s decision would not affect the state’s ongoing investigation into allegations of fetal organ harvesting. Last fall, the state of California enacted Assembly Bill 775. The law, which went into effect on January 1 of this year, requires pregnancy centers in the state to have written statements posted in all clinics making clients aware of the state’s abortion programs. In response to this pro-abortion law, three faith-based pregnancy centers filed a lawsuit against the state on Thursday. Under the law, health clinics that provide pregnancy-related services must inform their patients about California’s public programs that offer family planning options, including abortion. California has public programs that provide immediate free or low-cost access to comprehensive family planning services (including all FDA-approved methods of contraception), prenatal care, and abortion for eligible women. In addition to the pre-written statement, centers are required to provide the phone number to social services where callers are provided with additional information about abortion programs. Furthermore, pro-life centers that fail to provide the abortion information the first time will be subjected to fines of $500, and $1,000 per incident thereafter, notes World Net Daily. But three pro-life pregnancy centers have filed suit against what they are calling an unconstitutional law that violates their First Amendment rights by compelling speech with which they disagree. The plaintiffs in the case are Mountain Right to Life, Inc. (dba Pregnancy & Family Resource Center), Birth Choice of the Desert, and His Nesting Place, represented by the Liberty Counsel. An actual controversy exists between the parties involving substantial constitutional issues, in that Plaintiffs assert that the challenged statute violates the Free Speech and Free Exercise of 8 Religion rights of Plaintiffs guaranteed under the First and Fourteenth 9 Amendments to the United States Constitution and by Article I, §§2(a), 4 of the 10 California Constitution, while Defendants assert the Act comports with the United 11 States and California constitutions. This is reminiscent of the government-mandated messages in George Orwell’s 1984. AB 775 mandates that these faith-based, crisis pregnancy centers utter a state-drafted, pro-abortion message or be fined up to $1,000 each time they fail to comply. What we are seeing is the evolution of political correctness. While the PC movement used social consequences to restrict speech, now the secular, progressive California legislature is using the law and fines to mandate speech. This is not only anti-American, it should be terrifying to every freedom-loving American. The right to speak and the right to refrain from speaking are both protected by the First Amendment. This is not the first challenge to California’s controversial law. When AB 775 was passed last October, two faith-based pregnancy centers — Care Net Pregnancy Center and A Woman’s Friend Pregnancy Center — sought injunctive relief that would have excused them from having to provide their clients information about abortion. Forcing a religious pro-life charity to proclaim a pro-abortion declaration is on its face an egregious violation of both the free speech and free exercise clauses of the First Amendment to the Constitution. We will not rest until this government mandate is completely halted. And though the judge seemed to agree with their constitutional arguments, injunctive relief was not granted. U.S. District Judge Kimberly Mueller, who presided over the case, admitted that if the court denied the plaintiffs the injunctive relief, they were “likely to suffer irreparable injuries with respect to their constitutional rights and incur civil penalties,” but the burden to prove that the “injunction is in the public interest” was on them, and they failed to present sufficient evidence of that. Judge Mueller ruled that the public’s interest was to ensure that women in California were made aware of all their reproductive healthcare options. Mueller acknowledged that the law’s required notice is compelled speech, but defended it as speech that “provides truthful, non-misleading information to the clinics’ clients during their appointments” and “does not otherwise restrict speech,” noting that the clinics opposed to the law may continue to criticize it during appointments with the clients and may still advocate their own religious beliefs. Still, Titus states that he is not surprised by California’s efforts to suppress its citizens’ constitutional rights. However, if past precedent is any indication, AB 775 may not withstand the opposition. According to Life News, the law closely mirrors ones found in Austin, Texas; Baltimore and Montgomery Counties in Maryland; and New York City, all of which were thrown out after courts determined the government-mandated messages were unconstitutional.